Bake a 8 inch or 10 inch round two layer cake of your choice. Ice in white buttercream icing. Divide the sides into six sections. 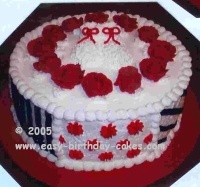 Using red and black icing and star tip size #18, do the design on each section using the picture as a reference. Pipe the shell border in white icing and star tip size #18. Then do the shell border on the top and bottom of the sides. Next, place a circle of red roses on the top. The roses are made with rose tip #127. The white leaves are made with leaf tip #366. In the center make two white booties using star tip size #18 and building up the layers until you have a foot shape. Then make a circle around the heel end. This will make the ankle cuff. With red icing and round tip size #5, make a small bow on each bootie.